Dublin players warm down after the game was called off. 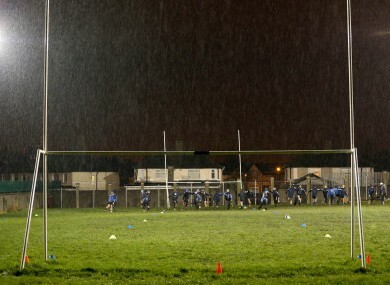 TONIGHT’S WALSH CUP game between Dublin and UCD has been called off due to bad weather. Details as to when the game will be rescheduled have yet to be announced, according to the official Dublin GAA website. In addition, a decision on Saturday night’s O’Byrne Cup final between Dublin and Kildare will be made tomorrow. Meanwhile, in football colleges action today, reigning Corn Uí Mhuirí champions Pobalscoil Chorca Dhuibhne defeated Rochestown College by 1-4 to 0-6 in their quarter-final tie this afternoon. In atrocious weather conditions the Kerry school, who include current Kingdom boss Eamonn Fitzmaurice and former county defender Tommy Griffin amongst their management team, prevailed narrowly at the Dr Crokes pitch in Killarney. Pobalscoil Chorca Dhuibhne lead by 1-0 to 0-2 during the first-half but the teams were tied at 1-2 to 0-5 at the interval before the Dingle-based side ultimately claimed a narrow victory. They now go forward to face De La Salle (Macroom) at the semi-final stage on February 10th in a repeat of last year’s decider. Elsewhere in the Leinster Colleges SAFC, there were second round wins for St Mary’s (Edenderry) – the reigning Hogan Cup champions – Marist Athlone and St Pat’s (Navan). St Mary’s (Edenderry) were 3-5 to 1-4 victors over Portmarnock CS. Marist Athlone enjoyed a 15-point success against Coláiste Mhuire (Mullingar) in an all-Westmeath clash. And St Pat’s (Navan) were 2-8 to 1-7 winners against Moate CS. Finally, the draw for the Leinster Schools semi-finals was also made today and can be seen below. Email “Tonight's Dublin-UCD Walsh Cup match called off due to bad weather”. Feedback on “Tonight's Dublin-UCD Walsh Cup match called off due to bad weather”.